We are the UK’s leading manufacturer of custom printed tape due to our quality materials, service, commitment and honest price promise guarantee. In addition to the fastest lead times in the industry and the lowest minimum order quantities available. All of our printed tape products can be custom printed to your exact specifications we also match colours to your pantone reference. 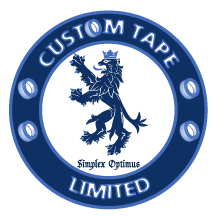 Custom Tape Ltd strive to make the process as easy as possible to order just send us a copy of your logo/design and our in-house design team will do the rest (visual proofs supplied within 24 hours). 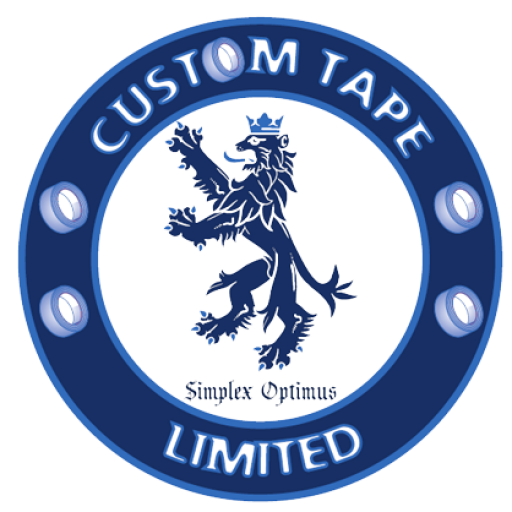 Call 01772 434444 or email sales@customtape.co.uk were one of our highly experienced sales team will be glad to help. Also printed tape is an ideal way to get your message across in transit or at the goods final destination as a constant reminder of your company. Using our printed tape can also avoid loss of parcels and packages significantly, as well as securing goods in transit. Secure your parcels and boxes easily with the our Standard Stock Printed Packing Tape. White coloured with the wording printed in bold red. This packing tape can alert package handlers and courier services to when your package contains breakable items or items that need special handling. The tape is resistant to abrasions and damage, offering extra security when sealing your package. The large, eye-catching print promotes easy visibility and identification. Ideal for everyday use, making it ideal for heavy use in warehouses and factories. Unwind it easily or use with a packaging tape dispenser for even easier application. If the text required is not listed we will be more than happy to accomodate your requirements please drop us an email to sales@customtape.co.uk (or use the forms provided) or call 01772 434444 & one of our friendly, professional sales team will answer any questions you may have about the production process. High visibility Strong & durable, non-adhesive barrier tape from stock at the UK’s best prices and fastest lead times in the industry! 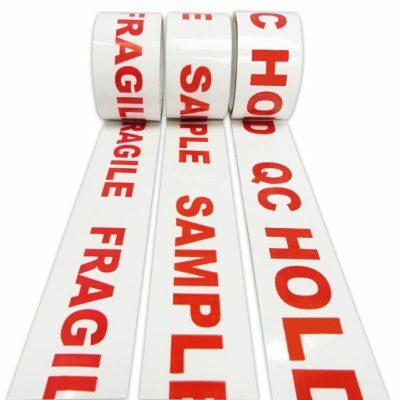 Custom printed barrier tape is manufactured from high strength non-adhesive polyethylene, we can print upto 3 spot colours onto this tape, ideal for events, crowd control or health and safety. Pre printed underground warning tape from stock at Custom Tape Limited. This tape is used as an indicator for buried services. We have dozens of underground warning tapes in stock for example: Electric cable below – gas main , water pipe / water main below, fibre optic and communications below and many many more. Bespoke printing is also an option for any of our tapes. Buy pipe identification tape from stock at the UK’s best prices and fastest lead times in the industry! 100s of pre-printed texts available from stock example: Directional Arrows – Fire Main – Flammable Gas – Cold Water Feed – High Pressure and many more printed to British standard colours. We are the only tape printing company in the UK that can print and supply 4 colour tape for pipeline identification tapes. Buy Hazard Warning Tapes from stock at Custom Tape Limited the best value in the UK. Various Hazard Warning Tapes are available from stock High visibility – Strong & durable, non-adhesive. eg: men at work , Restricted area, no parking / entry, Warning trip hazard, Caution building unsafe, Do not enter etc. We can manufacture to your exact specification if the item you are looking for is not listed. Buy floor marking tape from stock at the UK’s best prices and fastest lead times in the industry!Floor Marking Tape and Professional Floor Marking Systems can be used in factories, schools, sports halls and public places for effective demarcation and guidance within buildings. All stock orders placed before 3pm will be dispatched for next day delivery. Buy bag neck sealing tape from stock at Custom Tape Limited We stock bag neck sealing tape (also known as bread bag tape) in 9mm & 12mm sizes in case sizes of 144 Rolls 12mm or 192 rolls 9mm. Avialable in various colours Red, Blue, Green, White and yellow. Buy Fire Door Warning Labels from stock at the UK’s best prices and fastest lead times in the industry! Adhesive Fire Door Labels 100m. All fire doors must have a fire door keep shut sign on both sides of the door at eye level.